Capt. 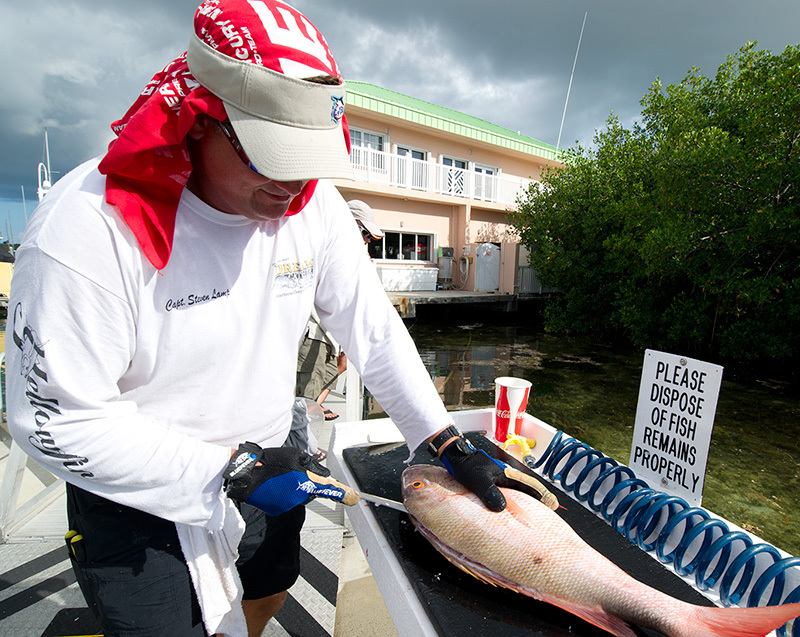 Steven Filets a Mutton Snapper for dinner. December 17th 2013 — Occasionally, I hear some folks that come from up North snipe at the fact we have no seasons here in Key West. Being a 4th generation Floridian I have never held a snow shovel or had to chip my car out of the ice. I have never made a snow angel or slid off the highway for no apparent reason. I have missed out on an entire cult of ice fishing and hunting in freezing temperatures. Chopping wood also seems a bit arduous, but is that any better than cutting a tree off the side of my house after a good hurricane? From my point of view I don’t feel like I have missed much. Yet, most of the people I know from “up North” all tell me they still miss the seasons. Here in Key West, we do indeed have seasons. My Northern friends can stop snickering now. It’s true. In the summer the palm tree fronds are dressed from the South East and in the winter they dress from the North by North East. We have tourist season and off season. That brings me to fishing seasons. Here in the Florida Keys we have great fishing year round; however, knowing the seasons is super helpful. Flats, backcountry, wrecks, reef or deep sea fishing all have great fishing throughout the year. The differences are the seasons, how we fish and why. I enjoy all the the fishing seasons that the Keys have to offer, but in my opinion winter fishing here out of Key West is one of the best times of the year. Meat hunters looking for great table fare have it best during the winter in my opinion. All year long there is a tasty fish to be caught in several of our arenas, but the winter has the monopoly with a smorgasbord of species both inshore and offshore. On the flats we have redfish, and in the backcountry we have pompano, trout and nice sized mangrove snappers all within reach even on a sloppy day (which happens a lot in the winter). The reef is covered with great table fare. 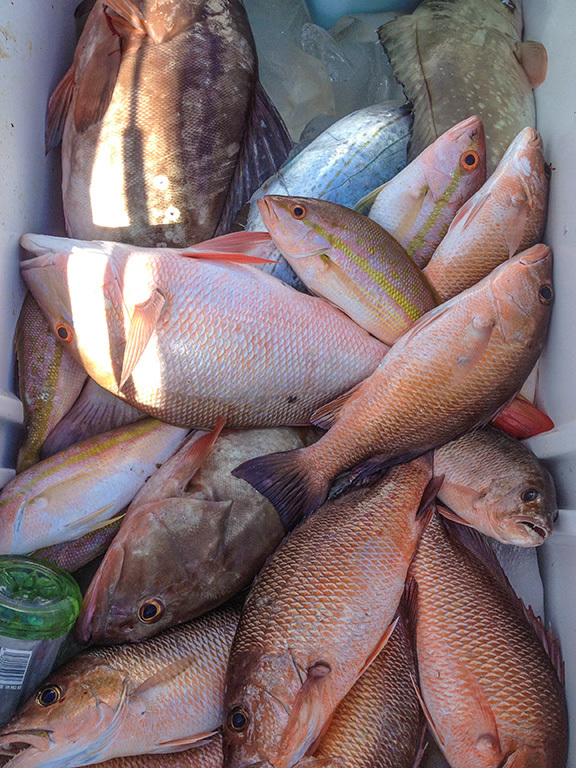 Yellowtail snappers, grouper and those tasty mutton snappers make up a nice set of filets. The bummer is the grouper closure in January, but these fish can still be fun to fight. While wreck fishing we can also add cobia to the list this time of year, and one fish can feed an entire village. Into Mackerel? You are in luck with all three species: King, Cero, and Spanish ready to eat anything that looks like a bait fish. Blue water fishing also holds a bountiful feast. Blackfin tunas run up and down the reef like its their job . During the occasional South East wind often brings up nice gaffer dolphin (mahi mahi). Add that to a shot at a wahoo and wow! Now you are dining right. Wrap all that up, put it on ice and you can see that Key West’s winter meat hunting is awesome! Sport fishers are not left out in the winter at all. Some of our hardest pulling fish come here in the winter. Just so happens many of them are edible. But lets talk about the release fish. Throughout the winter here in Key West sailfish are taken on all sorts of techniques on top of and just outside of the reef or color change. Fun jumps and nice photos make this fish a classic Key West trophy. Large amberjack are plentiful on the wrecks, pull hard and make a good release. On the wrecks permit make our list as they are the size of barn doors and fight like gladiators. Sight fishing for permit on the wrecks and the flats is one of my favorite things. And we cannot forget about the many sharks that we have in the backcountry. It is easy to hook up and release lemons, bulls and black tips almost every day in the backcountry in the cooler temps unless there has been a huge temperature change. Lastly, the bluefish, lady fish and jack crevales are all hard fighters ready to pull on the rod for some fun action on light tackle or fly in shallow water. So, as you can see, we do have our changing seasons in Key West. Currently, we are coming into winter fishing season and our little island town is filling up. The Christmas tree lots are selling out, the Christmas lights are up and there is a cool breeze in the air. Call your fishing guide or fuel up your boat and take advantage of the abundant winter season fishing Key West has to offer. And don’t forget some extra ice. Go get your fish on!